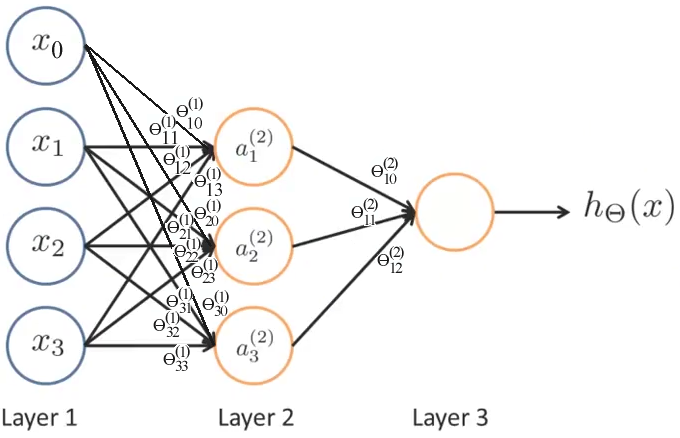 Unlike Linear Regression or Logistic Regression, Neural Networks can be applied to Non-linear data or data which would otherwise require to many quadratic features to classify. When there are many features, such as in machine vision problems and especially with Convolution, their combinations can quickly get out of control. NNs have been around since the '50's when they were developed as a way to mimic the operation of the brain. At that time, they were too computationally expensive, but they are making a resurgence given todays computing power. NN simulate real "neurons" by sending messages to each other. The connections, xn, are weighted by parameters On, and the weights are tuned based on experience. There is also an input that is not from other neurons, x0, called the "bias unit" which is always set to 1. The weight on the bias unit changes the likelihood that the neuron will fire irrespective of other inputs. Note: This is still just y = mX+b. The bias unit is b, (actually x0 always set to 1, then times O0 so that matrix math is easily applied). The inputs are X (vector) and the m are the weights On. Multiple Layers: NNs can have multiple layers where the top layer, directly connected to the external data inputs, is connected through to another layer, which may be connected to another, and so on before connecting to the final, output, layer. The inner layers are called hidden layers. Each neuron in a layer is normally connected to ALL the neurons in the next layer, or to one of a few neurons or even a single neuron, in the case where the next layers has fewer neurons. For a multi-class classification NN, with K classes, there would be K output units and only one would come on at a time. It is common to have a single neuron on the last, or output, layer. In that case, the computation from the last layer looks a lot like Logistic Regression. In fact, each layer is it's own set of mapping input to recognized features. Multiple Parameter Vectors: Because there may be multiple layers, we must add a new dimension to our vector of parameters O. The weights on a specific layer (j) may be represented by O(j) and a specific weight between node (i) of the prior layer and (i') of the next layer as Oi'i(j). The activation, or value computed for output, of a specific neuron (i) in a specific layer (j) can be represented by ai(j). ai(j) = "activation" of unit i in layer j. If a NN has sj units in layer j (not counting any bias units) and s(j+1) units in layer j+1, and each neuron is connected to every neuron in the next layer, then O(j) will be a matrix of s(j+1) by sj + 1. That last "+1" is because of the bias unit. sj is the number of units not counting the bias unit. Notice that the (j) superscript denotes the layer, the subscript denote the node i within that layer, and in the case of the weights, O, the first subscript is the node in the higher layer, and the second is the node in the lower layer. E.g. O10 is the weight, on a1, of x0 from the prior layer. Note: this example did not include bias units in the hidden layer. Note: When propagating from one layer to the next in a NN, it's critical that the size of the matrix match, including any bias unit columns. For Matrix multiply or divide^, for A*B, the second dimension of A must match the first dimension of B, and the result will be a matrix which is the first dimension of A by the second dimension of B.
except that there is an additional dimension for the extra units (k). Also, because there are parameters (weights) between each node of the prior layer for each node of the next layer, there are two additional dimensions for the regularization (j,i,l) Note that we still do not include the 0th elements (the bias units) so the indexes start with 1 not 0. Don't confuse that with Octave which starts indexing from 1. In Octave, start the regularization from 2, or zero out index 1 after computing the cost before regularization. Note this cost function is not convex and can, but rairly does, get stuck at a local minima. To calculate this cost function, the standard code can be used, but for a classifier NN, we must convert y from individual values, into a set of sets of vectors of zeros and ones where the value is represented by a 1 in the corrisponding location. e.g. if K = 3 and y(m)=2 then class_y(m) = [0; 1; 0]. If y(m) was 1, it would be [1; 0; 0]. To do this (at least for numerical values) we use an identity matrix. In Octave, eye returns an identity matrix. E.g. eye(3) returns [1 0 0; 0 1 0; 0 0 1]. We can index that matrix on both dimensions, returning the y'th row, and all the columns in that row. e.g. eye(3)([2 3 1],:) returns [0 1 0; 0 0 1; 1 0 0] (1 in the 2nd column, 1 in the 3rd column, 1 in the 1st column). class_y = eye(K)(y,:); %how tricky is that? J = sum(costs(:))/m; %costs is a matrix now. (:) makes a vector. Note that we sum all the values before multiplying by lambda and dividing by 2m. TODO: Write a version of this that works for L layers. Computing the slope of the error for multiple layers is complicated by the fact that there are many parameters. Oij(l) vs simply Oj. We can think about the error of a specific node j in a specific layer l as dj(l). For the output layer L, dj(L) = aj(L) - yj or as a vector of j nodes, d(L) = a(L) - y Because we are talking about the output layer, j must be K; the number of outputs. For the earlier layers, again, as a vector/maxtix (not showing the ij node indexes) we have d(l) = (O(l))Td(l+1) . * g'(z(l)). Note the . * or element wise multiplication. g'(z(l)) is the derivative (note the ' or "prime" which means derivative) of the activation function g evaluated at the input functions given by z(l). Although the math to prove it is very complex, it is know that g'(z(l)) = a(l) . * (1-a(l)). There is no dj(l) for the first layer. Note that we only have the values needed to calculate the prior layers after we calculate the later layers, hence the name back propagation. Note this doesn't include regularization. Here is the overall method for calculating the gradients in a non-matrix format; there is a loop for each training example, and the vectors inside the loop consider that example only. for m = 1:sizeof(y) %for each training example. d(l) = O(l)Td(l+1) . * ( a(l). *(1-a(l)) ) %? calculate partial derivative for all i, j.
Dij(l) := 1/m Dij(l) if j is 0 %don't regularize bias term. To regularize the gradients, simply scale O by lambda / m while avoiding the bias units. e.g. Theta1(:,1) = 0; %remove bias units. The theta and gradient values are no longer vectors, but are now matrixes. The D or delta's also matrix. To use standard regression algorithems like fminunc etc... we must "unroll" them into vectors. For example, in a 3 layer vector, if there are 10 units in the first two layers and 1 in the last. We can make such an estimate for each element of a vector theta, by computing the estimate for the cost function once per element, but with only that one element being "tweaked" by e.
Hidden layers: Start with one. Make each hidden layer the same size; same number of units. More units is better, but expensive. More units in the hidden layers than input. The Gaussian Kernel SVM may be better for small feature sets ( n < 1000 ) and reasonable sample sets ( 10 < m < 10,000 ). Logistic or Linear Regression may be better for simpler problems with very large training sets or features. Fuzzy Logic and neural networks are two design methods that are coming into favor in embedded systems. The two methods are very different from each other, from conception to implementation. However, the advantages and disadvantages of the two can complement each other. The advantage of neural networks is that it is possible to design them without completely understanding the underlying logical rules by which they operate. The neural network designer applies a set of inputs to the network and "trains" it to produce the required output. The inputs must represent the behavior of the system that is being programmed, and the outputs should match the desired result within some margin of error. If the network's output does not agree with the desired result, the structure of the neural network is altered until it does. After training it is assumed that the network will also produce the desired output, or something close to it, when it is presented with new and unknown data. In contrast, a fuzzy-logic system can be precisely described. Before a fuzzy control system is designed, its desired logical operation must be analyzed and translated into fuzzy-logic rules. This is the step where neural networks technology can be helpful to the fuzzy-logic designer. The designer can first train a software neural network to produce the desired output from a given set of inputs and outputs and then use a software tool to extract the underlying rules from the neural network. The extracted rules are translated into fuzzy-logic rules. Fuzzy logic is not a complete design solution. It supplements rather than replaces traditional event control and PID (proportional, integral, and derivative) control techniques. Fuzzy logic relies on grade of membership and artificial intelligence techniques. It works best when it is applied to non-linear systems with many inputs that cannot be easily expressed in either mathematical equations used for PID control or IF-THEN statements used for event control. In an effort to change fuzzy logic from a "buzzword" (as it is in most parts of the world) to a well established design method (as it is in Japan), most manufacturers of microcontrollers have introduced fuzzy logic software. Most software generates code for specific microcontrollers, while other generates C code which can be compiled for any microcontroller. https://itnext.io/18-tips-for-training-your-own-tensorflow-js-models-in-the-browser-3e40141c9091 Training Tensorflow in the browser. http://playground.tensorflow.org/ Google has an in-browser playground for experimenting with neural networks. https://en.m.wikipedia.org/wiki/Spiking_neural_network Encorporates time.+ See also Natural Language processing. http://devblogs.nvidia.com/parallelforall/embedded-machine-learning-cudnn-deep-neural-network-library-jetson-tk1/ A deep neural net library that runs on NVIDIA GPU's. http://robotics.hobbizine.com/arduinoann.html A 3 layer neural network for Arduino, very nicely explained. Sample used to recognize digits from 7 segment display data. Could also be used to train bot to use IR sensors vs bump switches (e.g. to automatically callibrate IR readings).